A medical student’s summer “break” is usually non-stop work, as opposed to what the term may suggest. For Daniel Padilla, an Artesia native currently attending the University of New Mexico, that is definitely the case. For the next six weeks, Padilla is back in his homeland working with Dr. Johnny Moreno at New Horizons Wellness Center during his Practical Immersion Experience (PIE). Padilla started this new journey June 20, and his six weeks will be up July 28. As part of the PIE training, Padilla goes in to see patients before Moreno, conducts a physical, and asks the patient questions pertaining to their visit. Moreno then conducts a similar physical, and the two compare notes. 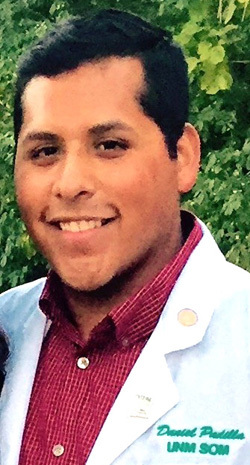 Padilla graduated Artesia High School in 2006, then ventured off to San Angelo, Texas, to complete his undergrad degree at Angelo State University. Once that was completed, he moved to Albuquerque to attend UNM Medical School in order to obtain his medical degree. Padilla says he sees a multitude of people he hasn’t seen in many years quite often since he’s been back to Artesia for this program. Padilla is still weighing his options when it comes to whether or not he will come back to Artesia to open a practice. After these six weeks are over, Padilla will take an exam and then get ready to start his second year of medical school. In the meantime, he’s very grateful for the opportunity Moreno has presented him with.